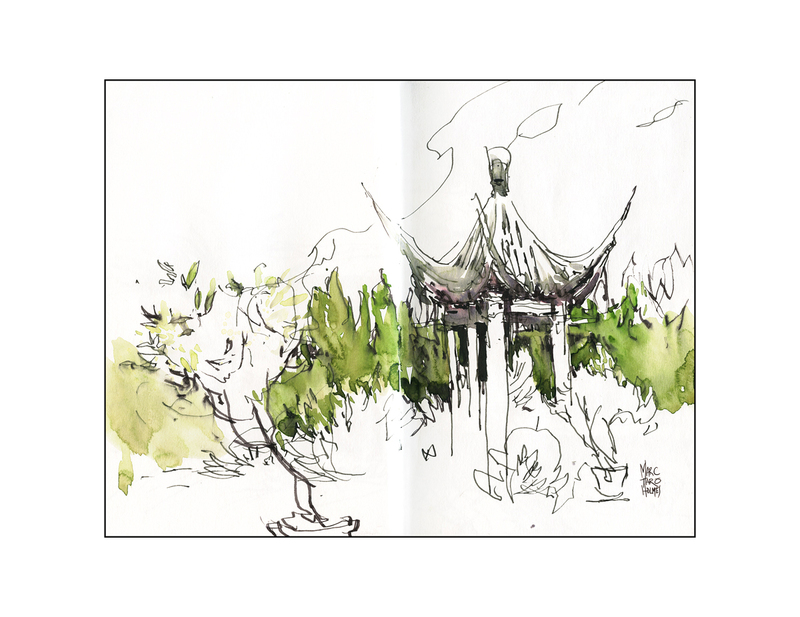 Spent the afternoon at the Jardin Botanique sketching in the Chinese Garden. 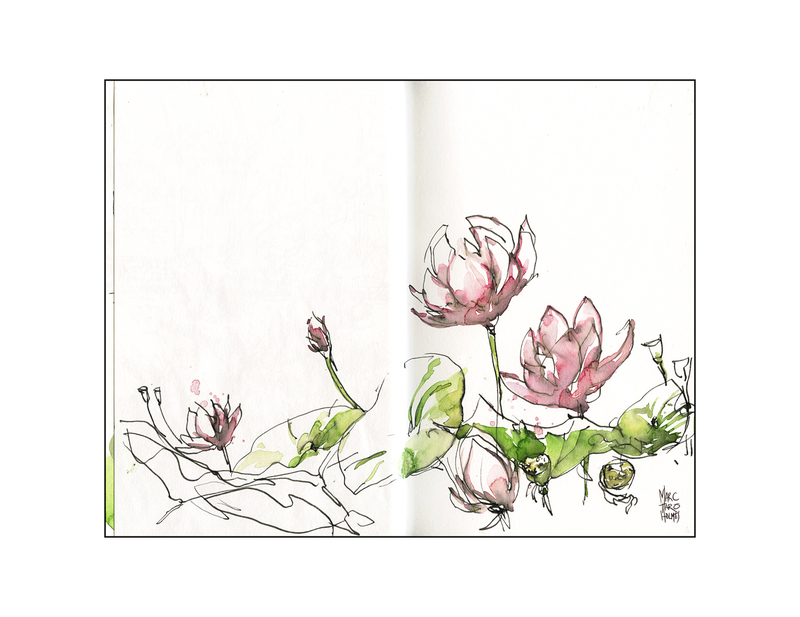 The Lotus are in bloom. It’s a pretty amazing show. A carpet of giant leaves and pink blossoms as big as a baby. Well, a premature baby. 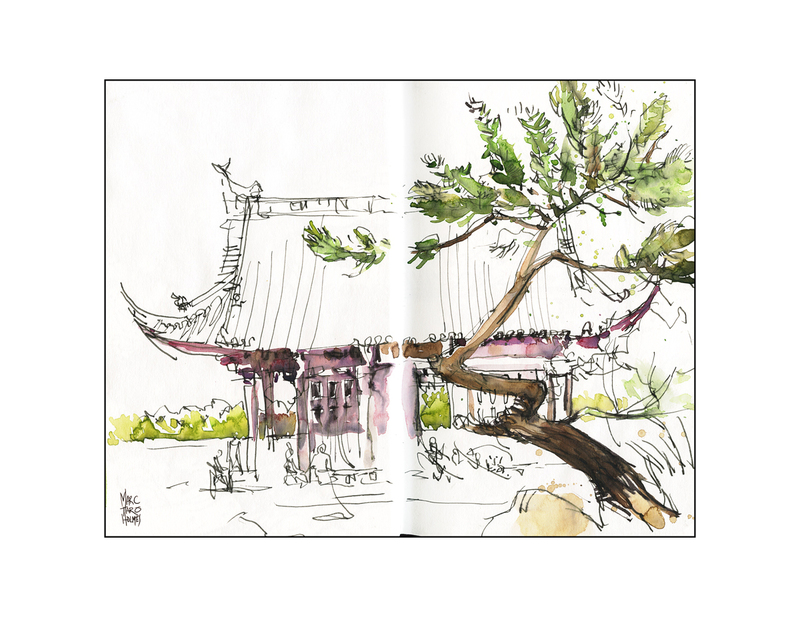 These days I’ve been doing so much painting on location, I’d almost forgotten what it was like to draw spontaneously in a sketchbook. (Answer – a lot of fun! Much less stress than trying to get a ‘good’ painting every time). We’re about to go on a family vacation to Newfoundland. Which some Canadians call “the Rock”. For reasons I expect to become clear on arrival. I don’t think I’ll be able to schlep around my full size painting setup with the Fam in tow – so I’m field testing a small 5×8″ Stillman and Birn sketchbook and some Lamy calligraphy pens. I’m really intrigued with the water-based ink in the Lamy ready-made cartridges. When you touch it with water, it melts the line work. A nice effect. The line softens where there is color, and at the same time greys off your wash. I think I don’t mind that. It’s a little out of control, which I like. Kind of an natural neutralizing effect. I’ll be playing with this on the trip – we’ll see if I still like it when we come back. Nice set marc. I like all the white space. They look great scanned. And not too much seam in there. This bodes well for Newfoundland. I think I want to be even more minimal with the color – since I really will be doing things on the fly. May try a few with just water and the LamyLine. See how that goes. My old friend Charles Reid uses some spit and his thumb. Why not try that? Hi Marc, I bought some watercolor pencils today, General Kimberly. 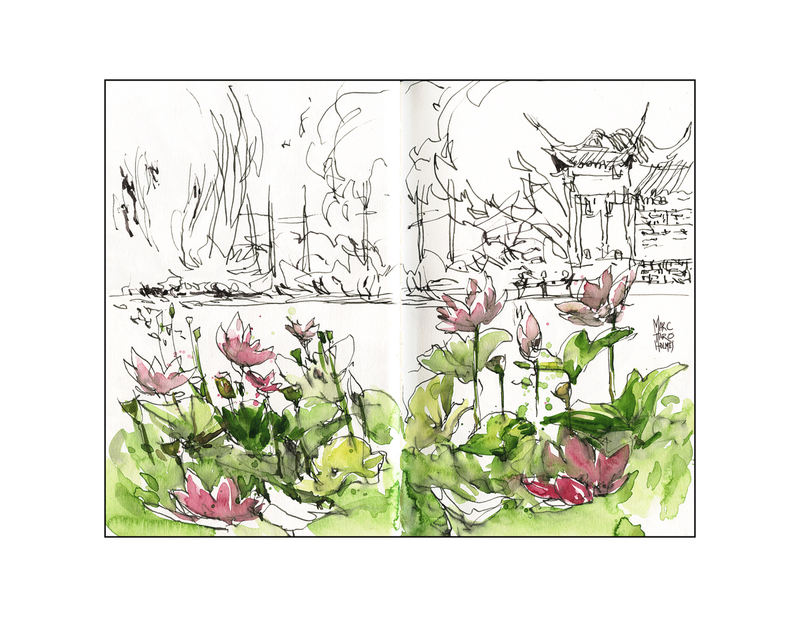 What other tools can you suggest for a beginning urban sketcher? I found two urban sketch groups locally in Chapel Hill and Raleigh. Hah. Now, the problem with drawing and chatting – (which is my favorite pastime) – is that I’ll say anything that comes into my head. I’m sure some Micron fans would get up in arms – but me, I’ve never been able to make them work. They just seem so dry and miserly. :) I like a juicy pen!